Walsh triumphed in the Novice Hurdle on board Antey to bring her race-riding career to a close. 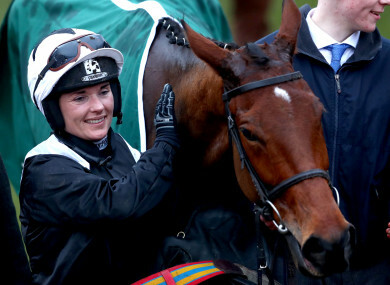 KATIE WALSH HAS announced that she is to retire after riding a winner at Punchestown on Friday. Walsh, daughter of Grand National-winning trainer Ted, announced her decision after narrowly triumphing in the SalesSense International Novice Hurdle on board the Willie Mullins-trained Antey. Walsh took over from Danny Mullins, who was unable to ride due to injury, and claimed the victory. Speaking to At The Races and other members of the media, she said that she was pleased to finish her career on her own terms, and is looking forward to the next chapter of her life. “It’s been on my mind for the last while,” she admitted. “There’s another chapter in life. I wanted to go out on a winner, whether it be here or wherever it may be and I just said whenever I rode the next winner that that would be it. Walsh continued by thanking her brother and fellow jockey Ruby, husband Ross O’Sullivan, and the many other people who helped her throughout her racing career. She also remembered the various winning horses she rode, including Thousand Stars. “It all worked out right. I didn’t think I was going to win half way down the back I can tell you but [it's been a] marvelous career. “I wanted to go out on my own terms and everyone is here — family and Punchestown couldn’t be a better place. “I’ve come to different points where I thought maybe this should be it. I wanted to ride in a national for Ross. I’ve done that. I’ve rode winners in France, Australia, England and Ireland. I’ve been lucky throughout my career to have the backing of Dad obviously and the support from Ruby and family, Ross and Willie. “I wouldn’t have ridden half of those winners without the backing of him. Email “Katie Walsh announces retirement after riding winner at Punchestown”. Feedback on “Katie Walsh announces retirement after riding winner at Punchestown”.